These Strawberry Lemon Hand Pies are the perfect vegan and gluten free dessert! The gluten free pie crust is “buttery” and flaky while the filling is sweet and bursting with strawberry lemon flavor. Not only do I love hand held desserts, but I also LOVE anything I can make into the shape of a heart. I mean, how cute are these heart shaped hand pies? They are also the perfect dessert to make for Valentines day! That’s part of the reason why I decided to add a lemon drizzle to this recipe. Of course strawberry and lemon are an amazing flavor combination, but my husband also loves all things lemon. So if I am going to make a dessert for Valentines day, it’s got to have some lemon in it! The gluten free and vegan pie crust on these hand pies is incredible! I tried SO many gluten free pie crust recipes before I found the absolute best one out there. The original pie crust recipe is from Allergy Free Alaska. If you haven’t checked out her blog yet, you absolutely need to! She has so many awesome recipes that are just as good as this pie crust recipe. I have made a couple modifications to the original recipe, but hands down this is the best gluten free and vegan pie crust around! The strawberry lemon filling only requires 3 ingredients and is crazy easy to make. These strawberry lemon hand pies also remind me a lot of pop tarts. I can assure you that they are SO much tastier, but if you are missing pop tarts then you are going to be thrilled with this recipe. Flour Blend: Oat flour, millet flour, arrowroot starch/flour, brown rice flour. Xanthan Gum: Acts as a gluten substitute in baked goods to prevent ingredients from separating. Vegan butter: I use “Earth Balance Vegan Buttery Sticks”. Powdered sugar or substitute: I use “Swerve Powdered Sweetener“. Whisk together dry ingredients: In a large bowl, whisk oat flour, millet flour, arrowroot starch, brown rice flour, xanthan gum, and salt. Cut in the butter: Using a fork or pastry blender, cut the butter into the flour mixture until crumbly. Add remaining crust ingredients: Add apple cider vinegar and cold water and mix until a dough is formed. Roll out the dough: Place the dough onto a floured piece of parchment paper and place another piece of parchment paper on top. Roll out to about 1/8″ thick. Flour the top of the dough as needed to avoid sticking. Cut out the pie shapes: Use your cookie cutter to cut 12 hearts into the pie dough. You will need to roll out the dough a couple times to get all 12 cut out. Very carefully transfer 6 of the hearts to a sheet tray lined with parchment paper. Add the filling: Add 1/2 tbsp – 1 tbsp filling to the center of the hearts on the sheet tray. Using your finger, wet the outer rim of the hearts on the sheet tray with a very small amount of water (do not use too much!). Close them up: Carefully top each of the hearts on the sheet tray with the remaining hearts. Use a fork to seal the edges together. With a sharp knife, cut a small X in the center of each pie to avoid bubbling. Bake: Bake for 17 minutes or until the pies have lightly browned. Make topping and drizzle: While the pies are baking, combine topping ingredients in a small bowl. Once the pies have cooled a bit, drizzle with lemon topping and enjoy! There you have it! A delicious and super cute treat to make for your Valentine this year (or to enjoy all to your self!). I hope you enjoy these gluten free and vegan Strawberry Lemon Hand Pies as much as my family does! In a large bowl, whisk oat flour, millet flour, arrowroot starch, brown rice flour, xanthan gum, and salt. Using a fork or pastry blender, cut the butter into the flour mixture until crumbly. Add apple cider vinegar and cold water and mix until a dough is formed. Place the dough onto a floured piece of parchment paper and place another piece of parchment paper on top. Roll out to about 1/8″ thick. Flour the top of the dough as needed to avoid sticking. Use your cookie cutter to cut 12 hearts into the pie dough. You will need to roll out the dough a couple times to get all 12 cut out. Very carefully transfer 6 of the hearts to a sheet tray lined with parchment paper. Add 1/2 tbsp – 1 tbsp filling to the center of the hearts on the sheet tray. Using your finger, wet the outer rim of the hearts on the sheet tray with a very small amount of water (do not use too much!). Carefully top each of the hearts on the sheet tray with the remaining hearts. Use a fork to seal the edges together. With a sharp knife, cut a small X in the center of each pie to avoid bubbling. While the pies are baking, combine topping ingredients in a small bowl. Once the pies have cooled a bit, drizzle with lemon topping and enjoy! If the filling has spilled out of the pie crusts at all, I advise using a knife while the pies are still hot to gently separate the overflowed filling from the crust. Once the filling cools this is not easy to do so make sure you do it right out of the oven. Here are some items I used to make this strawberry lemon hand pie recipe. 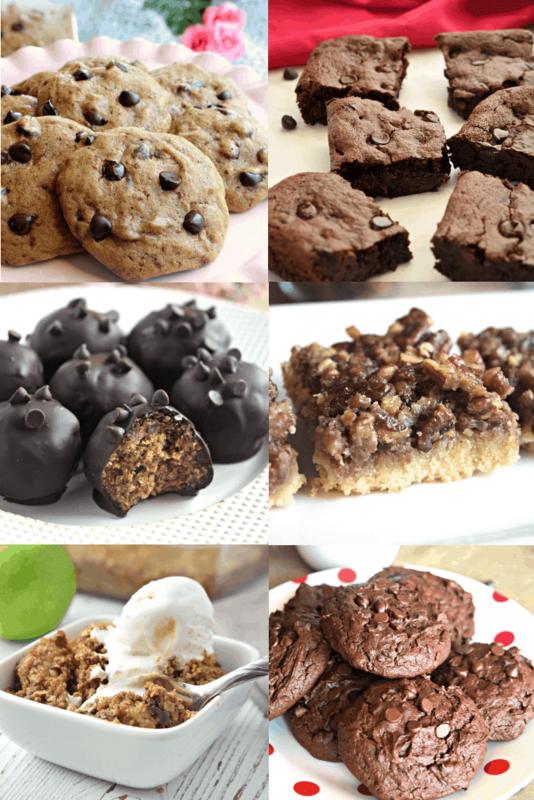 LOOKING FOR MORE DELICIOUS GLUTEN FREE DESSERTS? CHECK OUT SOME OF MY FAVORITES BELOW!